Researchers of KAIST have defined a novel strategy for the secretory production of free haem using engineered Escherichia coli (E. coli) strains. They utilized the C5 pathway, the optimized downstream pathways, and the haem exporter to construct a recombinant micro-organism producing extracellular haem using fed-batch fermentation. This is the first report to extracellularly produce haem using engineered E. coli. 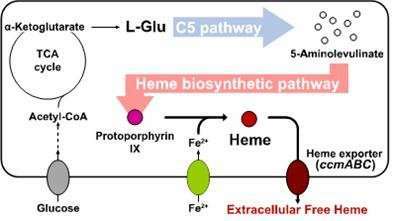 This strategy will expedite the efficient production of free haem to serve as a bioavailable iron-supplying agent and an important prosthetic group of multiple hemoproteins for medical uses. This study, led by Professor Sang Yup Lee of the Department of Chemical and Biomolecular Engineering at KAIST, was published in Nature Catalysis on Aug. 28. Haem, an organometallic compound complexed with a ferrous ion, is an essential molecule delivering oxygen in the blood of many animals. It is also a key component of electron transport chains responsible for the respiration of aerobic organisms including diverse bacteria. It is now being widely applied as a bioavailable iron-supplying agent in the healthcare and dietary supplement industries. The demand for haem and the need for the efficient production of this compound continue to grow. Many previous researchers have attempted to produce free haem using engineered E. coli. However, none of the studies was successful in producing free haem extracellularly, requiring an additional step to extract the accumulated haem from cells for subsequent uses. The secretion of haem in the form of haem peptides or proteins also requires an extraction step to isolate the free haem from the secreted products. Thus, the secretory production of free haem is an important task for the economical production of haem that is suitable for human consumption.